Dr. Joseph R. Lickteig did his under graduate studies at the University of Iowa from 1967 to 1970. He attended podiatry school in San Francisco at the California College of Podiatric Medicine, graduating in 1974. Dr. Lickteig spent two years in the army as a podiatrist and then moved to Newton, Kansas in 1976. He has practiced in the Newton and Wichita area since. 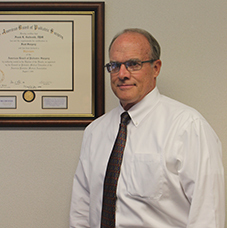 He practices general podiatry with emphasis on diabetic and conservative foot care.